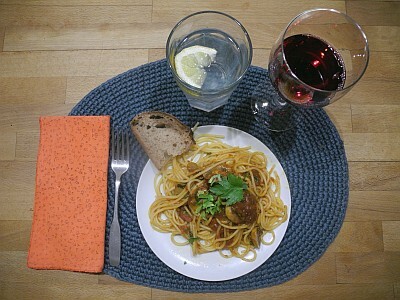 We had some of a bunch of parsley I bought I’m sure more than a week ago, still in water on the island, and D asked for that as he finished off the dinner. I chopped up all but 2 leaves – one for each of us – and he included most of that cooked in, and kept a bit, including the two full leaves, to put over the top. That’s it! We had a slice of the Morell’s Country Batard I bought Wednesday (this is Friday), which has a long life b/c it is very moist, and then I sliced the rest of the loaf (4 slices and one end) and froze it. 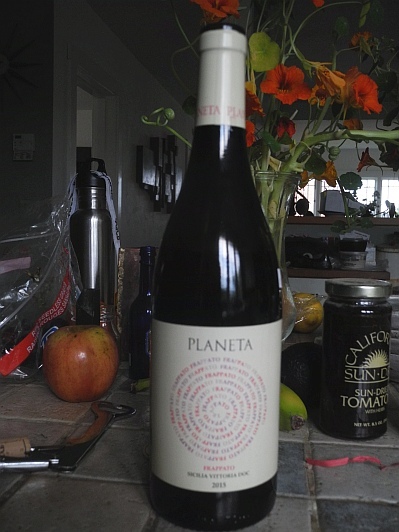 D chose a wine we had gotten “on spec” at The Wine Mine recently – a 2015 Planeta Frappato – b/c 1) we’d liked the Planeta wines in that day’s tasting, and 2) D wanted to try another Frappato. I think we liked it pretty well, but weren’t blown away by it. Price tag says $20 so we won’t likely get more. 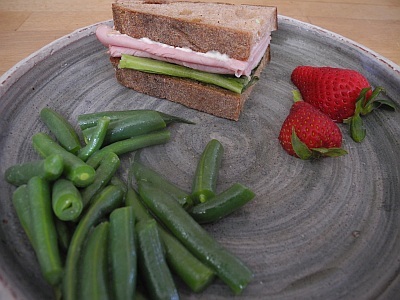 I used two slices of the Morell’s bread at lunch to make a ham sandwich with the Boar’s Head Smokemaster Black Forest Ham (sliced to order, from the deli) that I bought at the Bowl I think Wednesday. I actually don’t think this ham is all that interesting – not very smokey, for one thing. I bought it to try out b/c it was on sale for $9.99/lb. And b/c I wanted something to put on the Country Batard. Romaine, mustard, mayonnaise. Finished off the green beans by steaming 5 minutes and then tossing in a small bit of butter and salting them. Measure four shakes of our salt shaker to be 1/32 tsp (“a smidgen,” per the measuring spoon set we got from Restoration Hardware back when it was interesting). 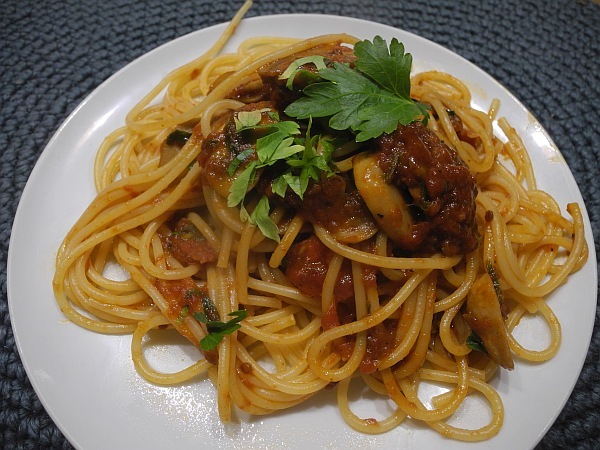 This entry was posted in Pasta and tagged Frappato, Green beans, Ham, Hard sausage, Lunch, Mushrooms, Parsley, Pasta, Sandwich, Sausage, Tomato sauce, Wine Mine. Bookmark the permalink.